What did the piece of paper say to the pencil? Write on, brother; show them what you're made of. Or in the case of Scott Snyder's and Greg Capullo's reinterpretation of this joke, die-die-die, mango-banana-watermelon, Agggghhhhhhhh! Read this comic book, now, as it's being published by DC Comics in March, 2016. TO QUOTE C. S. Lewis: 'Integrity is doing the right thing, even when no one is watching'. At the start of this book we hear the news that an off-panel tremor has caused a strange power outage to affect the musky city of Gotham. So as you can expect, in turn this has caused Batman to fear the worst, especially when he drops by Police HQ and is informed by Commissioner Gordon (Yes. He's back to form) that a group of Arkham inmates are trying to use this situation to their advantage. But fear not, dear reader! Doctor Arkham has this situation well in hand -- and illustrates as such with a slamming of an electrified-gate and a yammer of his talkative-mouth. 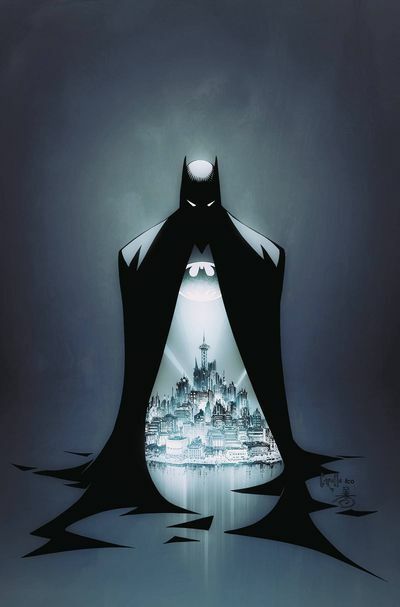 What's more, when Batman then goes on to look into this matter further -- by snooping and sliding in and out of such characters as the Court of Owls, the Penguin and his henchmen, plus that man on the park bench who's really good at smiling -- ultimately, he discovers nothing. Jack all. All except for the fact that an off-panel tremor has caused a strange power outage to affect the musky city of Gotham. So what else can he do? 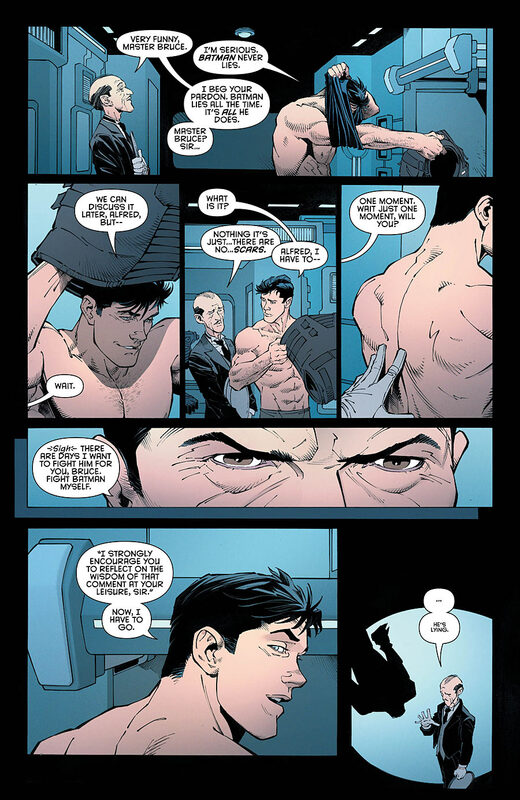 What can Batman physically do when he feels that his city is in terrible danger, particularly when the danger in question isn't so easy to spot? Answer: I'm not bloody telling you. Go and pick up this book and find out for yourself, skin-flint. Ha! Seriously though, I don't want to tell you too much as I fear I may spoil its 'niche value'. Yet what I am willing to say is that I did enjoy reading it more than I thought I would. In many ways this singular-story harked back to the Alan Grant and Norm Breyfogle era of storytelling, where characterization came first before action-packed set-up and major-events. I also loved how certain past-plot-threads were resolved or put to rest, such as the fact that Alfred has his hand back, the reclassification that the inside of Batman's cape is now purple, plus Batman's back -- No. Not his return, his actual back -- is finally scar-free thanks to... errr... Joker-Juice, or whatever you want to call it. Art-wise I must also applaud the synergy between Scott's words and Greg's illustrations. Sometimes I may not be a big fan of Scott's hyper-realized plot-lines or Greg's sketchy artwork, yet in the same breath, I do enjoy what they do on issues such as this one, and that is to tell a story, send out a message, make people think, and leave us on a high note and a promising future. Nice one, guys. See you soon. To see why I'm musically matching up this episode of Batman to the theme tune to Seinfeld, please check out the following section. Or don't. I don't care. Nahh-Na-Na-Nahh-Nahh! 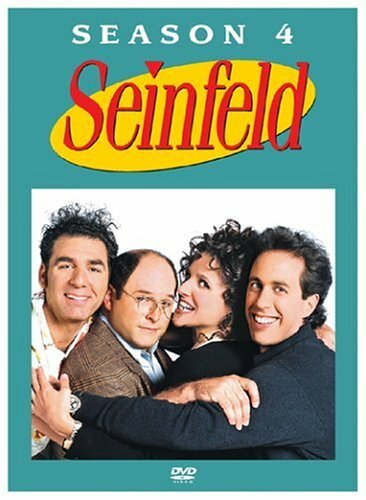 When Jerry Seinfeld made his 90s television series he said he made it using the premise that it was a show about nothing. No. Not a show about something. Nothing. Essentially it was about a bunch of people sitting around and talking about everyday matters, whilst pining for something else to do in between rejection, reflection, and humiliation. Hmm? Now I wonder what that reminds me of? You-Who! Mister Batman! Have you been up to much recently? Come on, slip out of your cape and have a jolly old chin-wag with Alfred your butler. Newman would! Sweden. Well, someone has to! Kim Kardashian and a can of beans. Sniff-Sniff! Can you smell Kanye? Nothing. It all happened naturally. The alternate script to Batman v Superman, the one that actually made some sort of sense. A politicians conscious plus other aspects of fantasy based literature. The lost city of Hubba-Hubba-Made-Up-Name, which comprises Kim Kardashian, a can of beans, eggs, Sweden, plus my missing door keys.